Bora Bora…Tahiti…French Polynesia…few places sound more romantic –bringing to mind beautiful waters with every possible shade of blue, palm trees, grass skirts, ukuleles, tropical drinks, huge smiles, dramatic scenery, and lots of hand holding opportunities. No reason to adjust that perception – it’s all true! 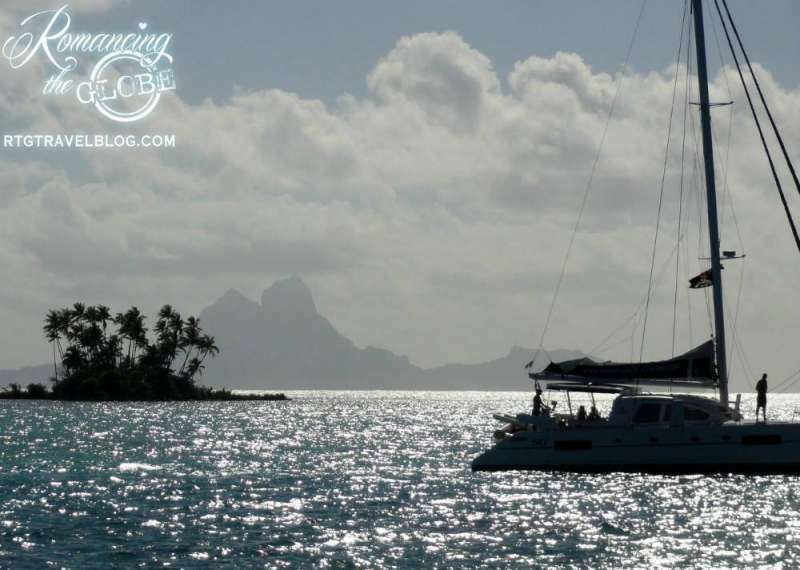 Now, take it up a notch (or 10) by sailing French Polynesia! Our sailing friends like to explore exotic, fun, places – and they certainly succeeded this time! French Polynesia is a long way from anywhere – south of the equator (almost directly 2,700 miles south of Hawaii and halfway between South America and Australia). Prior to learning more about this trip, we thought French Polynesia and Tahiti were synonymous – but actually, French Polynesia is the name of a large group of islands in this region of the Pacific. 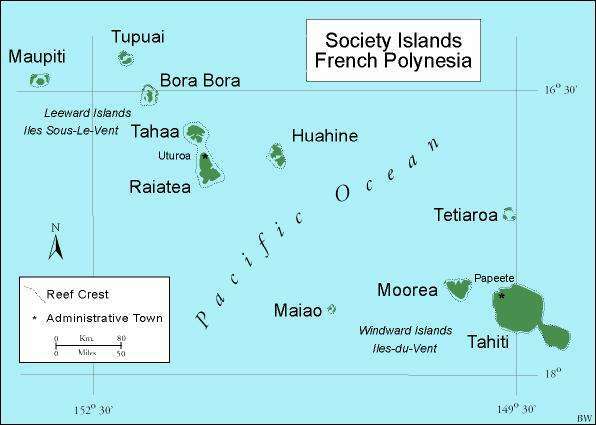 Tahiti is the largest and most populated of the dozens of islands of French Polynesia – Tahiti, Moorea, and the islands we sailed (Raiatea, Tahaa, Bora Bora, and Huahine) are the largest of the Society Islands in French Polynesia. To get to the main sailing base of operations in Rotorua, on the island of Raiatea, you fly to the international airport near Pape’ete, Tahiti, and then take a 45 minute prop flight to Raiatea. The marina for several charter sailboats companies and excellent pre-sail provisioning is found here. Prior to sailing, we stayed at the Hawaiki Nui Hotel – famous for being one of the first to provide the option of overwater bungalows to their guests. Nowadays, the bungalows are a little worn, but still watertight, spacious, charming, and half the price of an overwater bungalow at the newer resorts. Breakfasts and dinners were delicious. The beds are plenty comfy for snuggling, napping, and adjusting to the jet lag. Best of all, you can snorkel right off the deck of your bungalow! 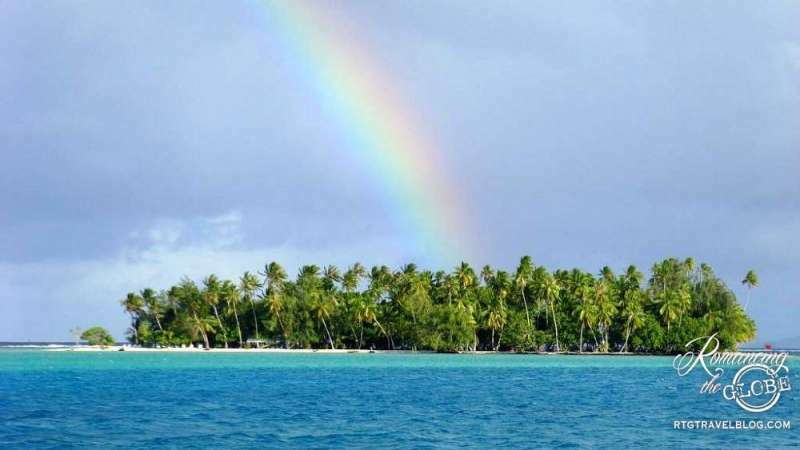 From Raiatea, our group sailed to the islands of Taha’a, Bora Bora, and Huahine. Each island is almost completely encircled by coral reefs with only a few breaks in the coral wide enough to allow boats to enter the calm blue lagoons. 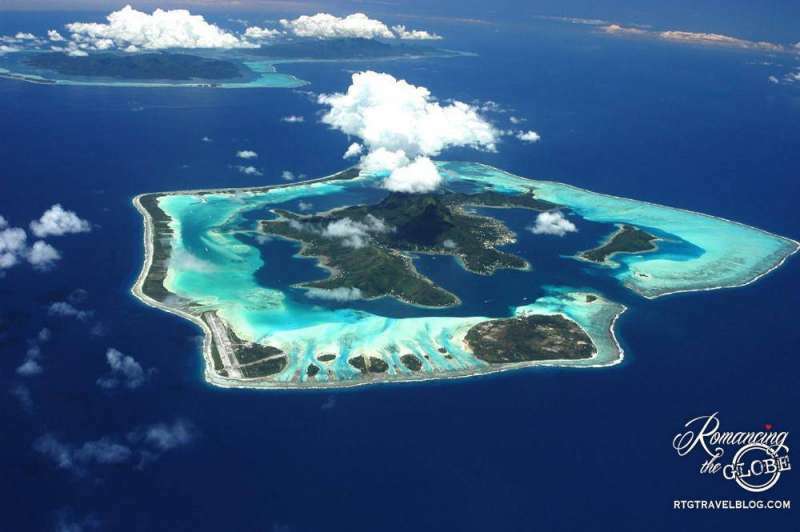 Bora Bora has only one lagoon entrance, on the west side. Within the lagoons, sailing is easy (as long as one avoids the reefs). But between islands, the distances, waves, and winds require experienced sailing skills. Large scale provisioning is scarce except in the main towns on Raiatea and Huahine, so plan accordingly. The craggy peaks dominate the sky and often trap passing clouds. Almost all the inhabitants live within a few feet of the water since the land rises so quickly. Most of the resorts are on the small islands (motus) fringing the lagoon. Bora Bora has many high end, world class resorts with amenities, classy restaurants, and prices to match. You’ll find names like Hilton, Four Seasons, St. Regis, Le Meridien, Eden Beach, and Pearl Beach. For sailors, the world famous Bloody Mary’s restaurant on the south end of the main island is a favorite. Noted for its drinks, sand floor and unusual bathroom fixtures (no spoiler here), the food is quite good, too. Scuba diving in Bora Bora and Huahine is a treat. The water is clear and fish are abundant – can’t say the same for the coral. Sheila’s first open ocean dive was here and she was promptly greeted by several circling sharks! She was grinning so big she could barely keep her mask clear of water – she is now officially hooked – a mermaid for life! Off the island of Tahaa, a small scenic private motu hosts the relatively unknown Pension Atger dotted by a handful of guest cottages. The owner (Theodore) can arrange a private group dinner given advanced reservations. He includes live Tahitian music, a dockside aquarium including rays and sharks, a cooking demonstration of his underground pits, and a delicious buffet. Our group of 45 sailors had a great time and added some dancing to celebrate a birthday. The island of Huahine has slightly less dramatic mountain scenery but a much wider, longer, and more navigable lagoon. It offers great cruising and a nice private beach that our group rented for a beach party complete with bonfire and barbeque. At the southern end of Huahine, we found Avea Bay to be so beautiful and relaxing (and with good shore dining), that we decided to spend an extra night. One more perk of bareboat sailing…changing the plan! Do I look like a shark or like I need a good cleaning? Through the islands, snorkeling is excellent nearly everywhere – usually within swimming distance of your anchorage, or a short dinghy ride away. 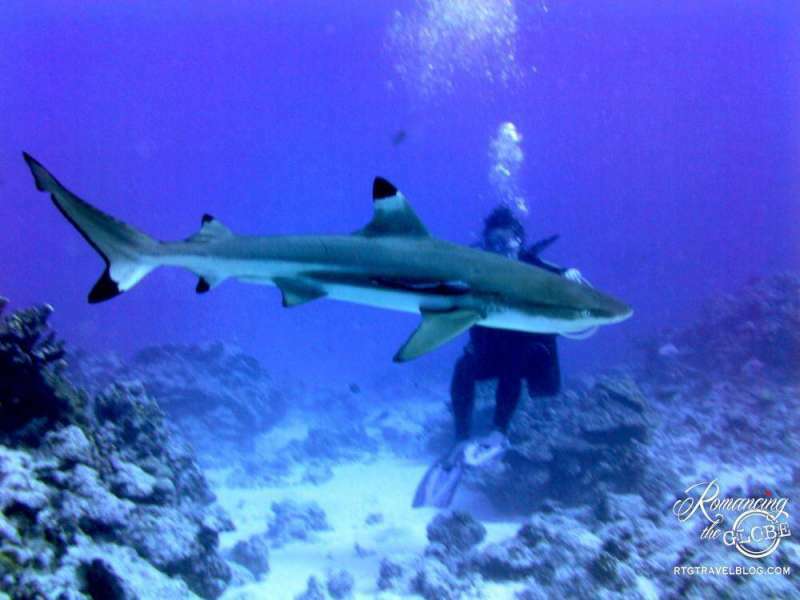 In Huahine, one persistent and slightly confused remora became very attached to Sheila…literally. …dramatic scenery, clear blue waters, and plenty of opportunities for private anchorages if that is your preference. The locals are friendly and genuinely happy to see you. We observed this with locals everywhere, not just in the service industry or on duty. People seem truly joyful. You might get lucky on your last night as we did, and have spectacular weather for photos. All of these were shot the same evening off the east coast of Raiatea with views of Bora Bora. After ten days of sailing and returning your boat to the marina, dinner and a hot shower at the Hawaiki Nui Hotel in Raiatea is the way to go. A great way to cap off your French Polynesia sailing trip is by flying back to the Pape’ete airport and taking a few extra days to explore the magnificent islands of Mo’orea and Tahiti. Our other bareboat sailing stories include: British Virgin Islands, Greece, Belize, Thailand and next up is St. Lucia, St. Vincent & The Grenadines.
? Have you explored any of French Polynesia? What did you love? I went there in my 20s and loved it. The islands are beautiful. Sailing sounds like a great way to experience it. This looks like an absolute dream trip! I don’t have any real sailing experience but I’ve always wanted to do something like this. Did you actually sail your own boat or have a captain? Do you have to be an experienced sailor? Lovely photos too! Hi Kate! Thanks! It really was dreamy. 😀 To answer your sailing question, yes and yes – we charter and sail the boat ourselves, but within our group are highly certified skippers, so our friends are the captains and we all pitch in rather than having to hire captain/crew. We wrote a post about it: “bareboat sailing”. But for those who don’t happen to have certified sailing friends, they can charter a boat with crew. Being able to go for a week or 10 days to amazing locations that the big boats, cruise ships, masses don’t go…is well worth it! Oh wow, it looks absolutely stunning there! Thanks for sharing this awesome post. Wonderful journey, beautiful photos and interesting story! Wow, this looks stunningly beautiful! Amazing marine life. I’d love to spend a considerable amount of time on a boat exploring the reefs and marine life.